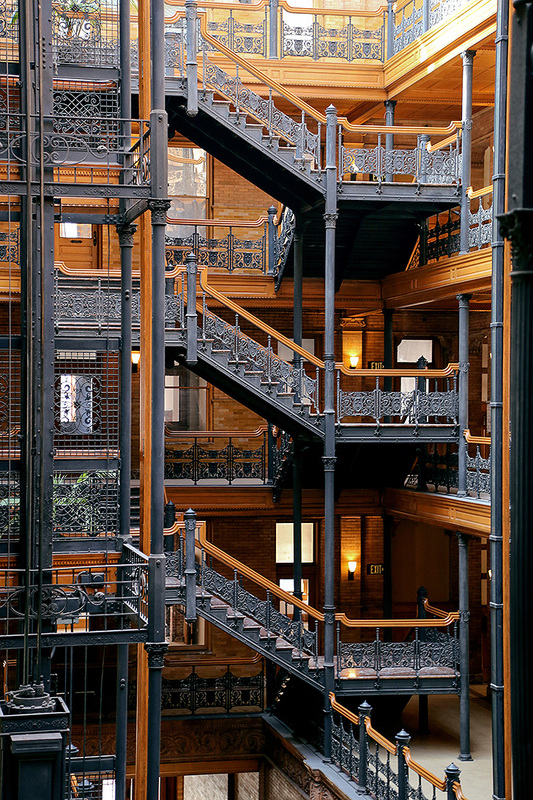 The Bradbury Building is an architectural icon of Los Angeles. Built-in 1893 for the gold-mining millionaire Lewis Bradbury, the landmark is best known for its gorgeous atrium with ornate ironwork. Not to mention the Belgian marble floors and tile, and detailed oak woodwork. Throughout its history, The Bradbury served as a backdrop for music videos, TV shows and movies, including the original “Blade Runner” sci-fi film. However, it’s primarily an office building, which is where Room & Board comes onto the scene. We recently partnered with Downtown Properties, which owns and operates the building, to furnish a spec suite to share with potential tenants. 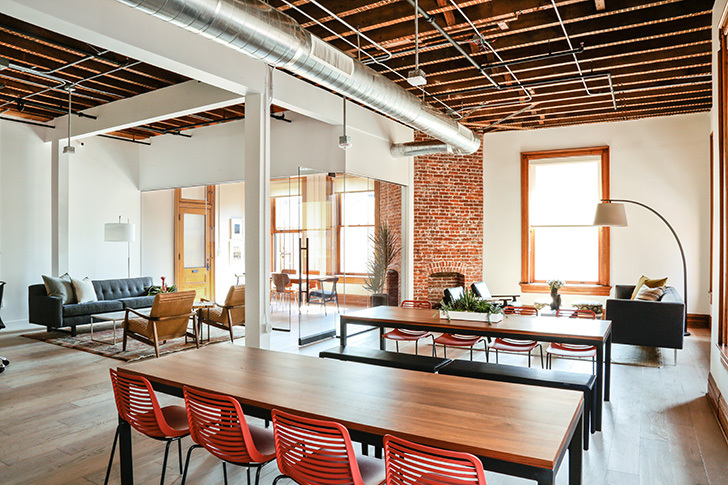 They achieved this traditional-meets-modern look by taking cues from the architecture for color selections, creating welcoming co-working spaces and keeping sight lines open. 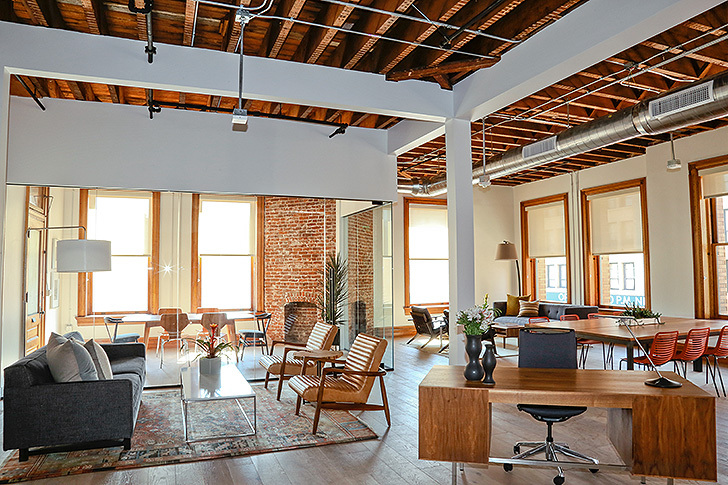 The floor plan they created has distinct zones to help organize the wide-open office layout. 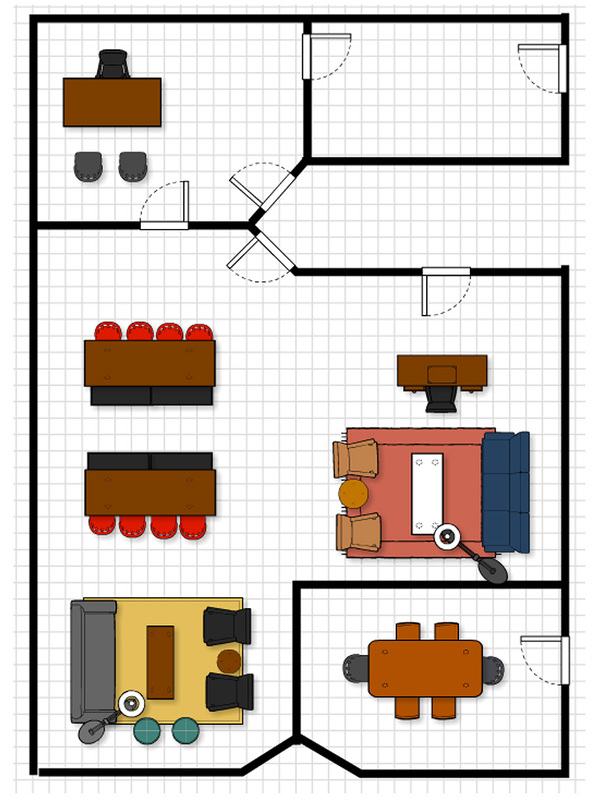 Our Business Interiors team offers complimentary floor planning to help you design your space. This lounge area offers comfortable seating that’s practical for a busy office, with a tight-back sofa and leather chairs. The space was arranged to allow maximum light to stream in from the windows. “The architects of the building created it to allow as much natural light into the space as possible—we didn’t want the furniture to interfere with this mission!” says Anna. 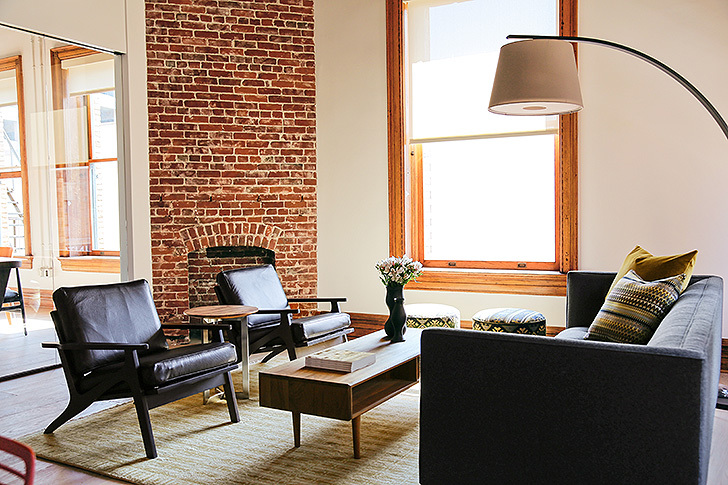 Another welcoming lounge space captures colors from the building’s architecture. Rugs were key in helping define the spaces and keep things cozy. The glass-walled conference room provides acoustical privacy but maintains the open feel of the office. 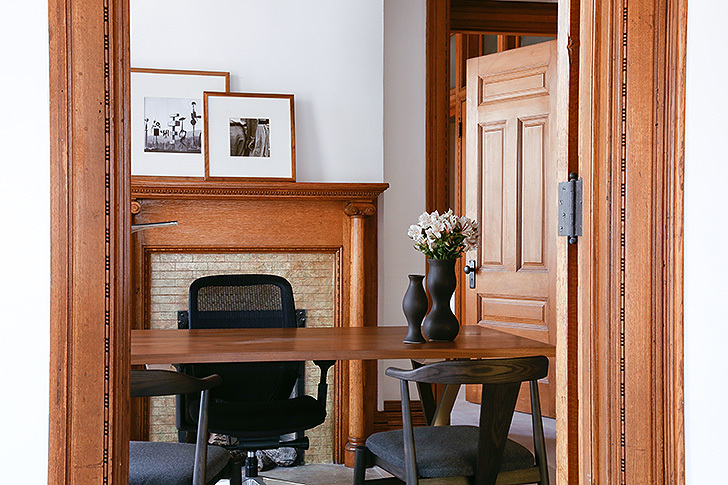 Walnut and charcoal-stained chairs blend elegantly with the other wood features of the room, like the original door. A simple desk and ergonomic office chair allow the fireplace in this executive office to be the focal point. Two low-profile guest chairs add function without visual clutter. Looking to refresh your office? 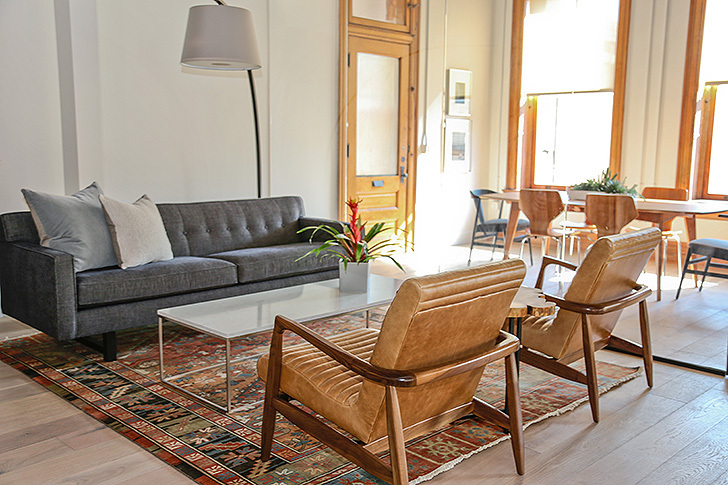 Our Business Interiors team specializes in creating functional spaces that inspire creativity and collaboration, plus their design assistance is available to you for free. 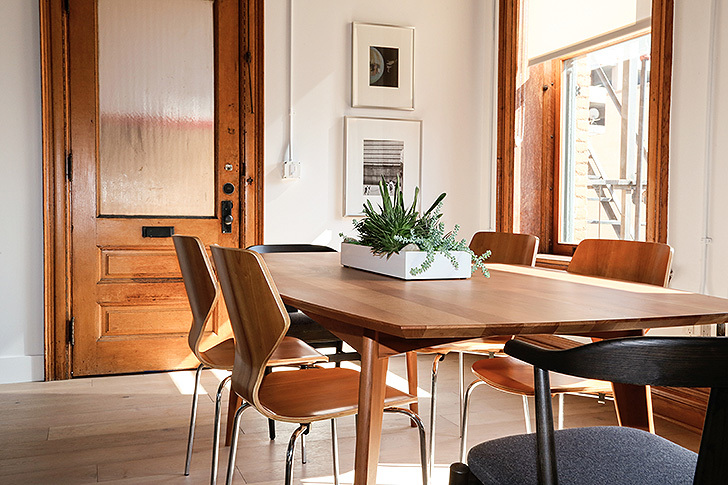 Start your project today or explore more office design ideas on the blog.